Friday 9 March. 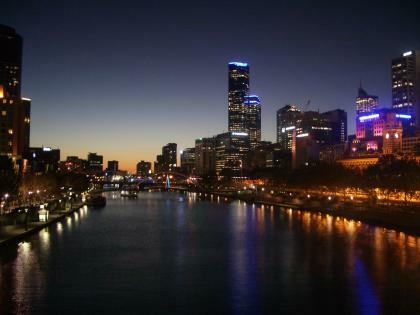 Melbourne and Williamstown. Today weather was clear blue skies with temperature reaching 23C with a cooling sea breeze. 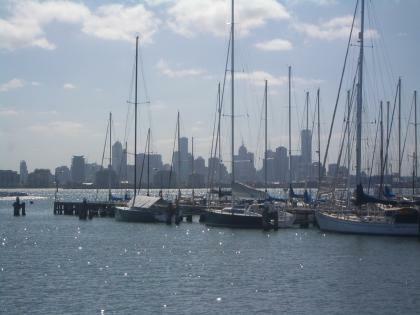 Today I took the tram downtown and then a river ferry to Williamstown. 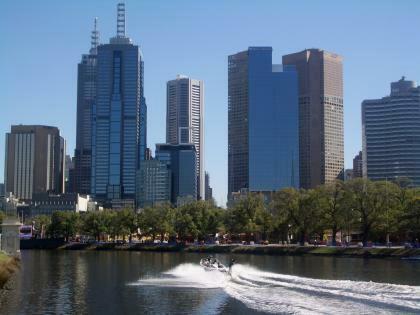 This is on the western side of the Bay on the Estuary of the River Yarra and opposite downtown Melbourne. The ferry trip took an hour as the river wound its way under bridges and among the docks. After looking round the waterfront I walked round to the Botanic Gardens and then a picnic lunch on the beach and an afternoon of sunbathing. I returned on a Connex Metro train and got off at a station 5 minutes walk from the hotel. In the evening I took the tram down into town again for dinner and more evening shots of the city. Friday 9 March. 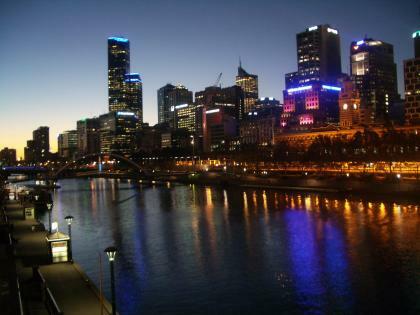 Western City from South Bank. 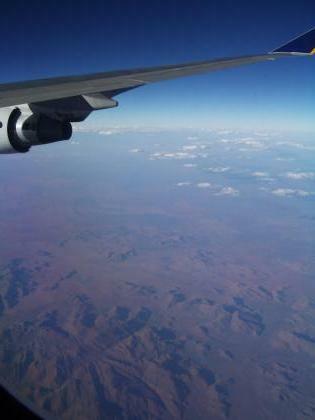 Weather today was mainly cloudy in the morning with clear skies in the afternoon and temperatures rising to 23C. Today was my last day on the bike on this trip. I wanted to clear the decks and leave tomorrow clear for a last look at Melbourne. Saturday I fly to Singapore and have 3 nights there and then fly home Tuesday. I will continue the Blog until Tuesday. Today I rode into the City from the Hotel which is on the NW edge of the Centre. 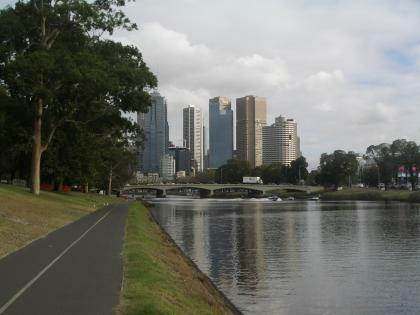 Then along to the River as I wanted to try out the Yarra River Bike trail. 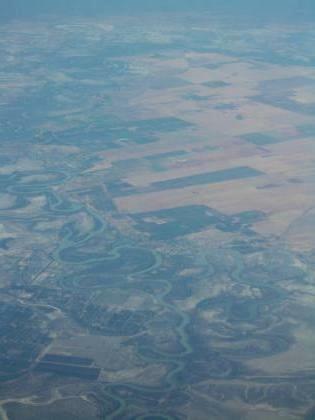 This follows the river east out of the City towards Richmond. After cycling in the city a little with the traffic and frequent stops for lights it was a pleasure to be away from it all with the bike path going underneath road bridges. I took the South Bank trail out of the City as far as it went which was 5 Kilometers or about 3 miles. Then onto the north bank trail back to the city. The trails are all tarmaced and well used by local cyclists. I stopped for elevenses at a bar by the River. Then some shopping and back to the hotel to pack the bike. I also sorted out luggage and posted some back home to ensure I stay in the stringent weight limits. In the evening more night shots of the skyline. 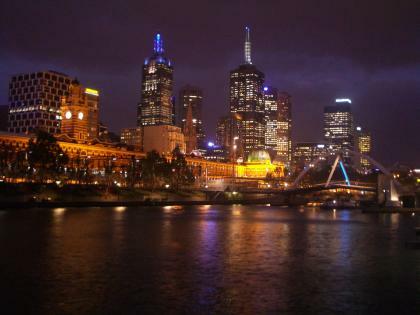 The city is very photogenic especially at night with the skyscrapers lining the river. 11 miles for the day and 167ft of climb. With the cycling finished I can now do the final totals. Over the 8 weeks in Australia I cycled 2291 miles or approx 3600 Kilometers. The feet of climbing was 64,422 or equal to cycling more than twice up Everest! Wednesday 7 March. Queenscliff to Melbourne. Today was sunny most of the day with the wind round to a strong northerly bringing hot air from the continental interior. Temperatures reached 31C. Today was my last day of riding with panniers on the trip. It was a short ride north and then east along the Bellarine Peninsula to Geelong and then a V.Line train from there to Melbourne. I took the rail trail north out of Queenscliff to Drysdale near the north coast. Then a 2 mile diversion and 200ft drop to Clifton Springs and a picnic lunch on the beach. Then back up to Drysdale and back onto the rail trail for another 10 miles east to Geelong. The rail trail went right into town and when it ended due to real rails it was easy to use backstreets following the rails to South Geelong Station. We had used the same station nearly 3 weeks ago when returning to Melbourne on the Great Ocean Road. On return to the Miami Hotel in Melbourne I had a pleasant surprise. I had booked a basic economy room with shared bathroom. However a school party wanted all those rooms so they had to allocate me a superior ensuit room with no extra charge. 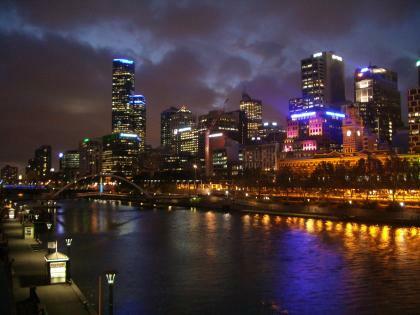 In the evening I took the tram downtown for some night shots of the City and Yarra River. The mini tripod got in some good use. 28 miles for the day 767ft of climb. Tuesday 6 March. Queenscliff. North eastern towns ride. Weather today was sunny with some wispy high cloud. Wind switched from yesterdays SW to a strong easterly and temperatures reached 24C. I decided on a ride today to take in the north eastern coastal towns of the Bellarine Peninsula facing the Bay. I first headed up the Bellarine Rail Trail for 10 miles up to Drysdale. 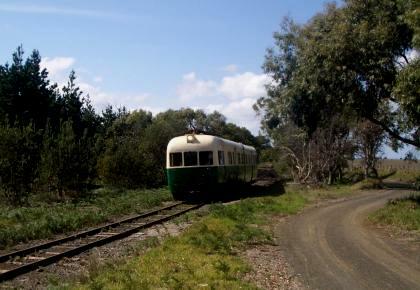 The rail trail goes further to Geelong but as far as Drysdale it follows the rails of a Steam Railway. The trains were running today, Tuesday, Thursday and Sundays but unfortunately weekdays outside the school holidays they put on a rather boring looking diesel which came past with some toots. Near Drysdale was the highest point of the day at 265ft but the next section of road to Portarlington on the north coast had repeated 100ft ups and downs. I stopped on the beach at Portarlington for a picnic lunch and sunbathe. 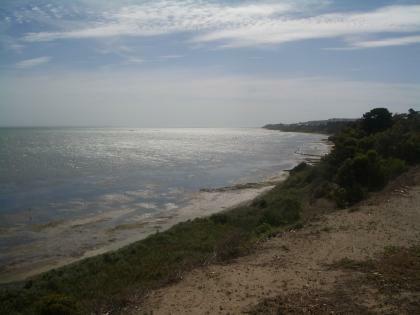 This part of the coast faces due north into Port Philip Bay. Central Melbourne is a little closer at 27 miles as the crow flies. 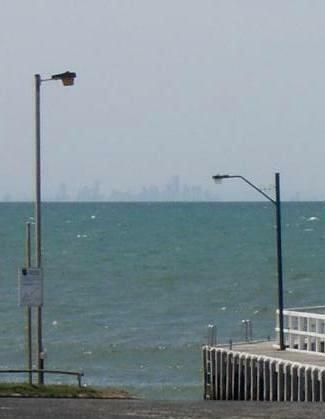 Despite the distance the skyscrapers of Melbourne were visible on the horizon. It must have been the higher buildings only visible with their bases being below the horizon. It gave the effect of some distant citadel floating on the ocean. I followed a very quiet esplanade road round the coast via the small towns of Indented Head and St Leonards. Then a straight backroad to Queenscliff. I took more sunset pictures after dinner at the Vic again. 40 miles for the day and 977ft of climb. Monday 5 March. Queenscliff. Rest Day. Weather today was sunny most of the time with scattered clouds and a fresh SW wind off the Southern Ocean keeping temperatures down to 21C. After some shopping and getting on the Internet at the Tourist Office next door I decided on a short ride to explore the local area. The area is called the Bellarine Peninsula which is the land bounding Port Philip Bay on the SW.
We had seen the eastern part of this area when cycling from Torquay to Geelong and it was pan flat. I was expecting the same of the rest of the peninsula but was pleasantly surprised to find some good cycling territory with rolling hills getting to 200ft, good views and a network of back roads. Then on a back road near the coast to the town of Ocean Grove. 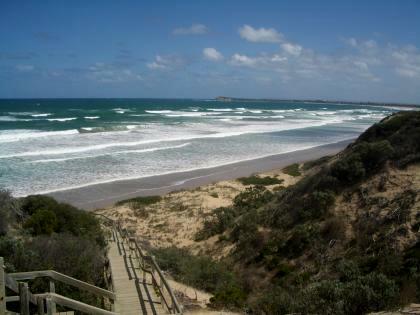 The sea is behind 50ft dunes and I took the bike up a path to a spot overlooking the great Southern Ocean waves breaking on the shore and stopped for a picnic lunch. Then more backroads north into the middle of the peninsula before finding a backroad that headed east and intersected the Geelong to Queenscliff rail trail. This is a gravelled trail going alongside for part of the way a steam railway. I took this back to Queenscliff. I find Queenscliff a pleasant place to stay as it is full of old houses built on gently rolling hills at the end of a narrow spit of land at the end of the peninsula. It reminds me more of a bush town than a town not far from Melbourne. 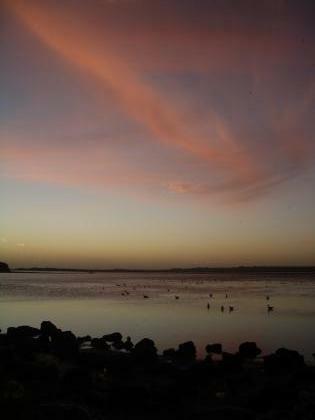 I had dinner at "The Vic" hotel down the road and then took pictures of the sunset over Swan Bay which runs next to Queenscliff. 29 miles for the day and 777ft of climb.